Ancient Stones - Lothian - 017 Stone Circle, Yadlee, Cranshaws. With a diameter of just over 9.00m and comprised of small stones barely visible above the short grass, Yadlee Stone Circle is one for the enthusiast and will disappoint those seeking anything spectacular. There are seven stones in the circle none bigger than 0.40m across and all less than 0.30m high. All but one are earth fast. The circle is situated on a level area of ground in otherwise undulating heather moorland and rough grazing. There are four earth fast stones outside the northern arc of the circle and a random group of five can be seen 10m to the west. Their purpose is not known. From the B6355 Gifford to Preston road, take the minor road just north of Whiteadder Reservoir, heading for Gifford. Stop at the footbridge before Johnscleugh. On foot, follow the well graded track (Herring Road) keeping right when the track branches. The circle is 10m from the track on the right. Off road beside track leading to Yadlee. 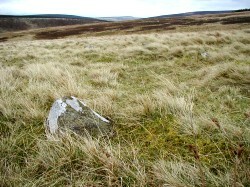 Little is known about this circle but of interest in the area is the Witches' Cairn, across the valley formed by the West Burn, on Crystal Rig. 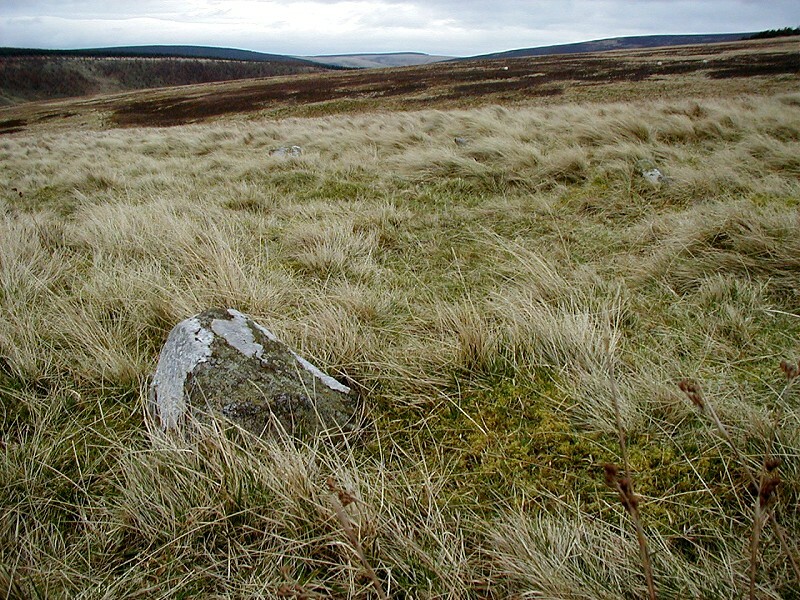 The cairn is hidden by forestry but such evocative names hint at past meanings. I feel there must be some connection? Although far from being a spectacular stone circle, this setting of small stones still has an air of mystery about it. Set in a desolate patch of open and windswept moorland, Yadlee Stone Circle makes you wonder about the people who took to time and effort to construct it in the first place. What rituals took place there? Why did they pick this location in the first place? In the day of my first visit, the weather was overcast and dull. The location is very bleak in mid-February and with only a lone skylark singing and a few grouse for company, yet still I had a great feeling of peace and solitude for the time I spend making my notes both in and around the circle. Almost lost and almost forgotten, this small and simple stone circle still has some magic left.